I stayed in Unit 11C for six years and throughly enjoyed my stay and planning to return. One Medano Beach is located in the perfect place for walking to Downtown, the Marina, or to the beach. 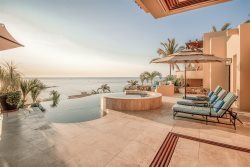 It also has a view of the Sea of Cortez from the balcony and during late January and early February has a great view of the sunrise. Lifestyle staff was very professional and helpful during my stay. Everything was exactly as they said it would be and it was very nice to be able to complete the grocery list in advance and have everything stocked upon my arrival. My only minor complaint, is that this unit did not have very hot water, but I got use to the somewhat warm showers. Great condo, great location, great facility management, maintenance and security staff, added up to a great stay. Look forward to returning later this year. We stayed at this condo unit for the month of October. We had an awesome time. We were walking distance from everything. This was a dream vacation. We will be returning in March. Our security, housekeeping and conciege was absolutely great. We enjoyed our stay. Hector was very helpful as was the on-site staff. Top notch customer service from Diana in reservations, Rosa handling our transportation and room stocking requests to Hector our 24 hour concierge. The location is perfect to walk everywhere- Medano Beach, the Mall, the Marina, Downtown. We have already booked a return trip in May!